It is challenging and exhausting being romantically involved with a narcissist, but they can also cause havoc when they leave. Break ups are always hard, but when you've been in a relationship with someone who uses others and is obsessed with themselves, it can be even harder. Dr Judith Orloff, a clinical psychiatrist at the University of California Los Angeles, wrote in a recent blog post on Psychology Today that narcissists can make you "fall in love with them so hard that it feels like you're giving up a part of your heart to leave them," because they're very good at becoming the centre of your universe while you're with them. Here's what to expect if you break up with a narcissist. If they're the ones to break it off, it can feel brutal and sudden. One minute you may feel like everything your partner has ever wanted, and the next you're left wondering what on Earth went wrong. This is because narcissists are great at playing a part while they're getting something from their source, according to Orloff. But when they're done using you, they have no difficulty in casting you aside like a used tissue. There will be no apologies or remorse, and you may well never hear from them again, regardless of how long your relationship was. If they do return, it will be because they've realized they can get something from you. If you're the one who chose to leave, on the other hand, be prepared for begging, pleading or bargaining. If you're the one who chose to leave, good for you because Orloff says that's hard to do. They are likely to give you the fight of your life because they're not done with you yet. Narcissists hate losing their supply, so they won't let you go easily. Prepare for them to promise "to change." They might suddenly start doing things for you that you'd been complaining about. They may say "you'll be lost without me," or "you'll never find someone like me." Don't listen, Orloff advises. It's just a trick to get you to come back to them out of fear. What next? Establish no contact. No contact is exactly what it sounds like: no contact whatsoever. That means blocking their number, making sure any emails from their address go into your spam folder, and deleting them off social media. 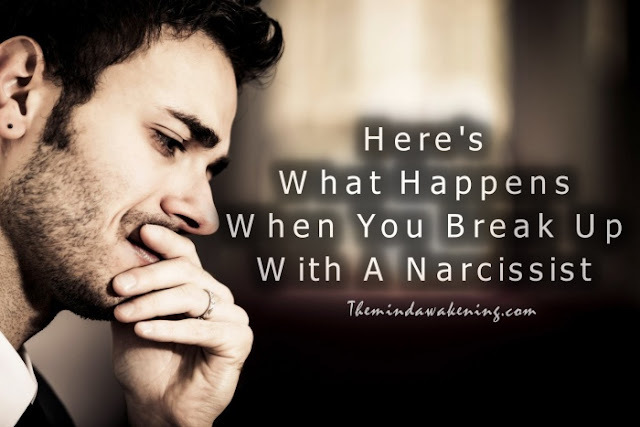 This is tough, but mental health councilor Dr Stephanie Sarkis explains in a blog post on Psychology today that it's the best option because sooner or later the narcissist will find a way to return. The narcissist will try to contact you if you cut off their supply, and they know just what to say to make you come back. So you have to be brutal, and fast. It may be best to break up with them over text also, so they can't manipulate you any further. If you left something at the narcissist's house, Sarkis adds, you should just leave it and let it go. Consider it a very small price to pay for your own sanity and well-being. Consider also removing people you have in common from social media. So unless you're very good friends with them, and you trust them completely, you should probably wipe the social media slate clean. You may have to repeatedly pause and remind yourself of why it ended. When you break up with someone, a few selective good memories can come flooding back, prompting confusing feelings of regret. These feelings are usually false and unrepresentative of the relationship, psychiatrists say. You might remember a time when your partner was sending you loads of messages every day and continually complimenting you. Compliments are great when they're sincere, but when a narcissist uses them it may be part of a technique called "love-bombing" in which the person bombards you with affection but has an ulterior motive. As a reminder to yourself, jot down the reasons you split up. Did your partner frequently put you down? Call you names? Make you feel guilty or like you were crazy? Your partner will likely appear to 'move on' quickly — and tell you about it. Most true narcissists don't need time to heal from a break up as their initial feelings about the relationship were likely insincere or absent. It's not unheard of for a narcissist to have someone already waiting in the wings as a new source of support, or have their exit strategy carefully planned out. This is one of the reasons removing them from social media can be helpful — there's likely to be a lot of loved up selfies. In reality, they may simply be love-bombing a new target. On the bright side, it isn't you anymore. Expect grief and embrace it, because it's important. Grieving will be an important part of your recovery, so embrace it when it comes, advises Sarkis. After all, you have a lot to grieve over: the end of a relationship, and the person you thought your partner was. They love-bombed you when they first met you, and these feelings are still there, and they are strong and intense. However, you figured out enough reason to get out of there, so remind yourself that many of these feelings were likely built on something false. The narcissist may have appeared to sweep you off your feet, but did they really deliver on their promises? Probably not. Nevertheless, you probably had, and still have, a strong emotional bond to the narcissist, and only time can heal that wound. Sarkis says be glad you ended things when you did, because otherwise you'd still be in that toxic environment, losing more of yourself every day. The pain is only temporary. Focus on yourself and do things that make you happy. Most importantly, you're going to need to focus on yourself, Orloff says. Take this time to try a new hobby or gym class, or go out and meet new people. This may sound daunting — being with a narcissist can use up a lot of energy and make you timid around new people. But you're out of that situation now. It's time to reconnect with people that make you happy. Sarkis and psychologist Dr Guy Winch recommend writing an "emotional first aid" list of things you can do as a distraction when you find yourself thinking about your former partner. You were pushed aside when you were with the narcissist, because your needs weren't important. Now it's time to look after you. You'll realize relationships aren't supposed to be that way. When the time is right, you'll find someone new. Dating is an important part of recovery. Still, you shouldn't expect to find "the one" right away. Just go out and have fun. Maybe you'll meet someone amazing, or maybe you'll make some great friends. Either way, these people will be a breath of fresh air. Plus, you'll likely have a deeper understand of your own boundaries than you did previously, so give yourself more respect if someone isn't treating you the way you want. When you finally develop your first crush after a relationship with a narcissist, it feels really great. It might not work out, but you'll be reminded of all the reasons someone actually likes you — and there are a lot! This is spot on. Many women I see in my practice can't let go because they trust the narcissist loves them. Its heartbreaking for them to let go and realise they were only loved for what they gave or offered the narcissist, being used as a narcisstic supply to serve their grandiose needs.